See Map: Queensland Map - Queensland Maps. Off the coast of Queensland, the Barrier Reef is one of the natural wonders of the world. Its gorgeous tropical and sub-tropical islands, multi-coloured reefs and even more multi-coloured fish attracts Australian and international visitors the year round. You can also explore this region in style with one of the many large luxury cruise ships, or stay at one of the luxury or family orientated island resorts. There is plenty of other styles of accommodation suitable for budget stays, from caravan parks, campsites, budget family motels to luxury secluded lodges with marvelous views. The Barrier Reef is a glorious eco-adventure paradise, diving, snorkelling, reef cruising and exploring some of the many islands - something different every day. You can take an aircraft or helicopter tour for a really awe inspiring view of this part of the world, or go close up by snorkelling, exploring the reef environment amongst the thousands of tropical fish. A growing attraction is to go whale watching and swimming with whales, these captivating and magnificent gentle giants of the sea migrate northward every year to their breeding grounds from the colder antartic regions. Diving is what many people come for, the glorious reefs are alive with countless graceful fish and other forms of marine life. You can also learn to dive at very reasonable priced diving schools offering qualified courses at places along the Coast of Queensland, including Cairns, Port Stephens and Townsville. For the experienced divers, there are plenty of charter boats available. You can also just sit back and take a glass bottom boat cruise and view this underwater wonderland in all its multi-coloured glory. Reef walking can be enjoyed at low tide on older dead reefs - use strong shoes and avoid walking on any live coral. Observe but dont touch, all kinds of biodiverse marine life still depend on the environment provided by reefs, alive or dead. Although much of the Barrier Reef National Park does not allow fishing, there is plenty of fishing to be had at the areas set aside. Join a fishing cruise or charter a boat with an experiened crew for a memorable fishing adventure. Stretching 2000kms along the coast of North Queensland, this wide stretch of coral reefs has hundreds of islands, many uninhabited, some with world class beach resorts. 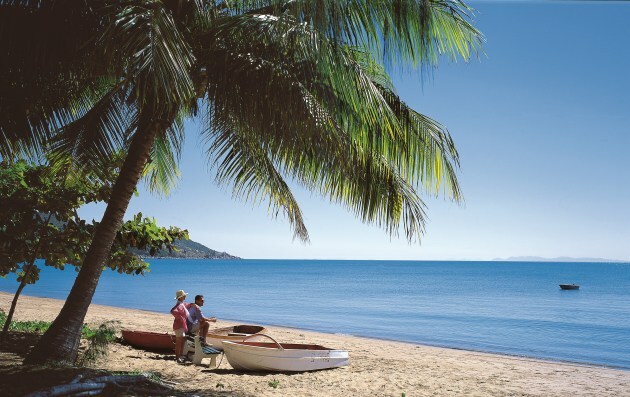 Magnetic Island is great for a family stay, the National Park covers more than two thirds of the island. Plenty of scenic forest and beach walks. Koalas, Goannas and Rock Wallabies make their home here, as well as much colourful birdlife. Dunk Island is just about all National Park, a beautiful place with a secluded world class resort at one of the beaches. Besides exploring the park, you can play golf, go sailing or windsurfing. They also have a kid’s club, specialising in keeping kids busy with all kinds of fun stuff. Bedarra is a small island, covering some 100 hectares. Adults only, it caters for those seeking a luxury tropical fun experience. The largest island of the Barrier Reef is Hinchinbrook Island. If wilderness and long walks are your thing, here is an ideal place. Explore the pristine beaches to the the rugged rainforest mountain slopes with picturesque views. There is a 32 km walk along the east coast of Hinchinbrook Island, this walk takes a number of days and is suitable for those both fit and self sufficient. Hamilton Island is great for families and romantic couples. Activities available include sea kayaking, twilight sailing, game fishing, scenic flights, diving, cuddling a koala, bushwalking, relaxing by the pool, waterskiing. Or you can just relax on the beach or by the pool. A good range of restaurants are on the island, at the Koala Gallery Wildlife Experience you can enjoy the "Breakfast with the Koalas". More about Hamilton Island. South east of Cairns you can take a Ferry Jetcat service to beautiful Fitzroy Island for swimming, snorkelling, diving, camping and exploring the island and its National Park of rainforest. In the Gladstone region on the coast of Queensland you can find some of the gems of the Great Barrier Reef, Heron and Wilson Islands. The beautiful Whitsunday Islands: Whitsunday Islands. During the wet season in the North of Queensland, (November to March) it becomes humid with plenty of rain, with the presence of deadly Box Jellyfish making swimming in the surf unsafe. There are beaches that have stinger nets, or you can use a purpose designed swim costume and of course there are swimming pools. Box Jellyfish avoid coral reefs, the Barrier Reef itself is free of them year round. The rest of the year the region is stunning, offering enchanting beaches backed by the sublime emerald and deep green rainforests and hinterlands. 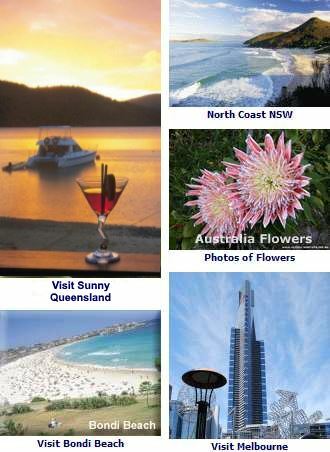 Shows Cairns and Surrounding towns, beaches, national parks and places to go : Tropical North - Cairns Map.